In the ongoing struggles of the Galactic Civil War, the Rebel Alliance has one distinct advantage over the Empire. While the ranks of the Imperial military are almost exclusively filled with humans, beings from countless worlds across the Star Wars galaxy have flocked to the Rebellion to commit themselves to the cause of freedom. 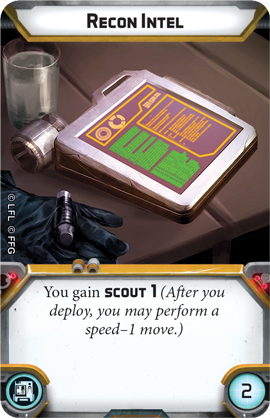 Each new species that joins the Rebel ranks can contribute to a mission in its own unique way, giving the Rebels options beyond rank-and-file troopers. Nowhere is this more evident than the Wookiee Warriors of Kashyyyk. Typically a peaceful species, these imposing warriors possess a volatile temperament that makes them absolutely terrifying when provoked. 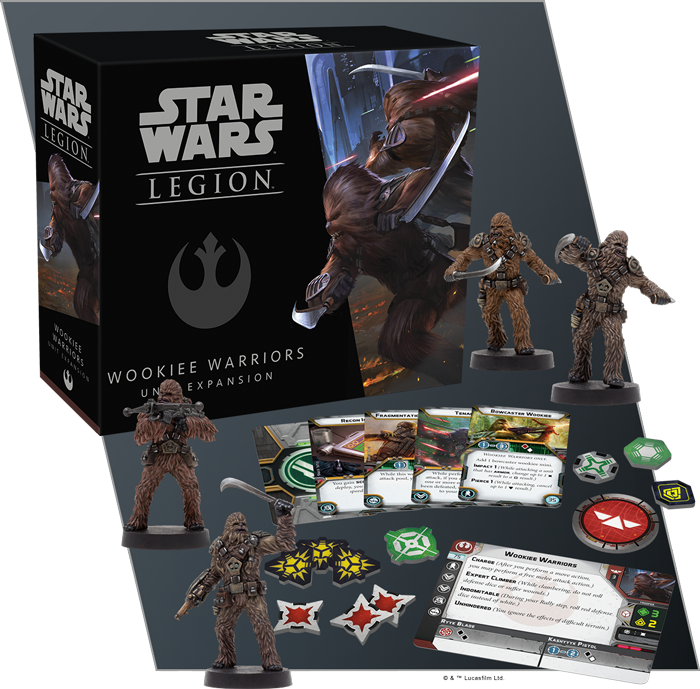 Soon you’ll be able to direct your Wookiees' fury at your Imperial foes on the battlefields of Star Wars™: Legion with the Wookiee Warriors Unit Expansion. 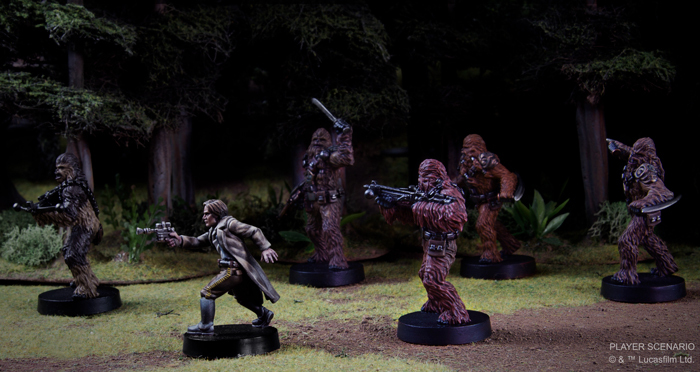 In this expansion, you’ll find four unpainted, easily assembled Wookiee Warrior miniatures eager to test their tenacity and resolve on the battlefield. Already fearsome on their own, five upgrade cards give you the chance to further enhance their abilities. 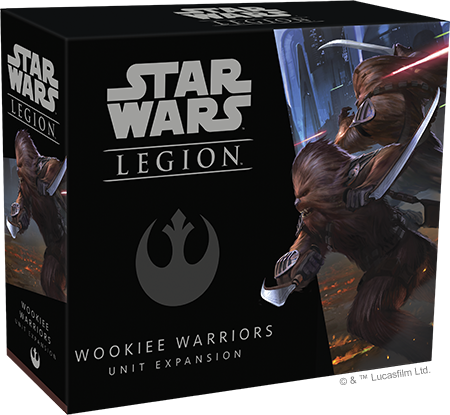 Finally, a unit card and a handful of tokens let you fully incorporate a unit of Wookiee Warriors into your armies. Join us today as we take a look at everything a group of Wookiee Warriors adds to your Rebel army! Hailing from the jungle and swamp covered planet of Kashyyyk, Wookiees have developed several characteristics to overcome the hazards of their home planet. Their great height, thick shaggy coats of hair, and extendable claws not only help the Wookiees thrive on Kashyyyk, but countless other planets across the galaxy. 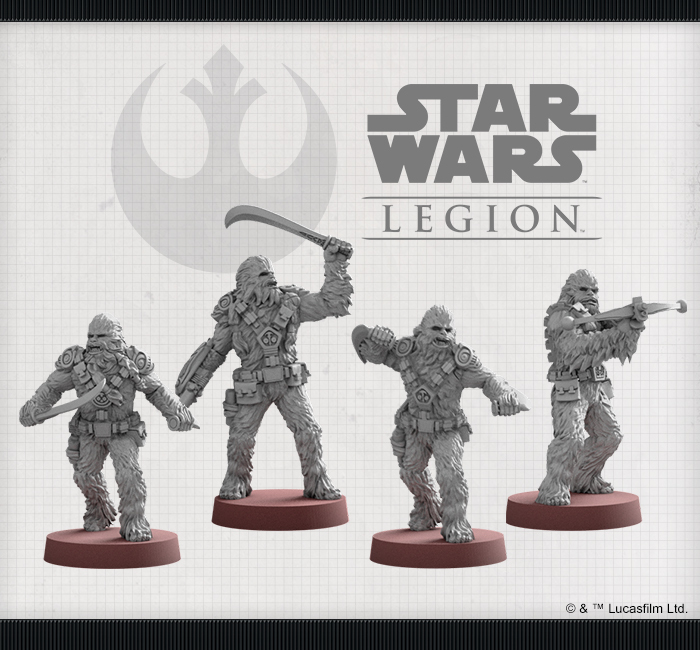 As a result, perhaps no other unit in Star Wars: Legion can adapt to the unique conditions of the battlefield as readily as the Wookiee Warriors. Equally at home on the icy plains of Hoth as they are in the scorching deserts of Tatooine, a unit of Wookiee Warriors features several built-in advantages over other units in terms of sheer mobility. For 75 points, then, your army gains a special forces unit that can quickly rush to almost any point on the battlefield with little concern for the terrain it has to cross. 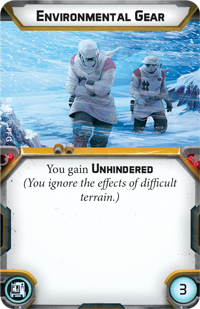 Naturally Unhindered, Wookiee Warriors ignore the effects of difficult terrain without having to commit extra points to equip Environmental Gear. This also frees up their Gear slot for more advantageous upgrades. For example, taking Recon Intel instead plays into the Wookiees' desire to move quickly and engage enemy units as soon as possible. But this is far from the only way Wookiees excel at navigating their environment. They also happen to be Expert Climbers, allowing them to effortlessly clamber over any terrain that might be between them and an objective or enemy unit. When Wookiees do enter the fight, they become more ferocious the closer they get to enemy forces. The Kashyyyk Pistol every Wookiee Warrior carries contributes a reasonable black and white die to a ranged attack, but engaging in melee combat lets our Wookiee Warriors use their immense strength to full effect. 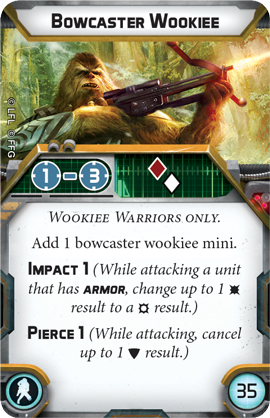 Each Wookiee Warrior contributes two black dice when fighting up close with their Ryyk Blades and, with the ability to Charge and perform a free melee attack after a move, few units will be able to escape their fury. Still, it’s likely you’ll want to make at least a few ranged attacks as you close in on your foes, and the Wookiee Warriors have a few different options for doing so. While attacks with their Kashyyyk Pistols can only target enemy units within Range 1–2, adding a Bowcaster Wookiee to your squad can give you a bit more range and a little extra power. 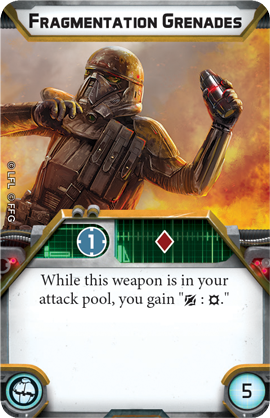 More importantly, when fired in conjunction with the Kashyyyk Pistols, a bowcaster adds both Impact 1 and Pierce 1 to the entire attack pool, giving you an even better chance of dealing some heavy damage before your Wookiees begin making melee attacks. Finally, the Wookiees can always carry Fragmentation Grenades to make one final attack at Range 1, weakening their opponents before charging in to finish them off in a melee. Charging directly at the enemy isn’t always the best strategy, of course, but the Wookiee Warriors are one of the few units that effectively use this approach. Known across the galaxy for their tenacity and resolve, Wookiees are not ones to back down. 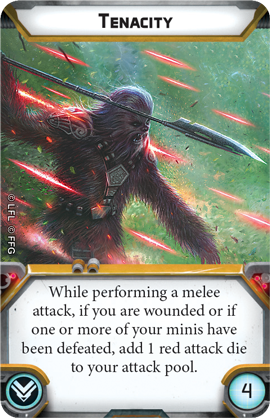 Every Wookiee Warrior can take a remarkable three wounds before being defeated, helping them remain at full strength even after drawing heavy fire. In fact, their Tenacity can be even more of a boon in battle, fueling their rage and enhancing their already powerful melee attacks. The Rebel Alliance can recruit beings from any number of worlds, but the Wookiees of Kashyyyk are by far their most fearsome combatants. Soon, they’ll be ready to roar into your battles of Star Wars: Legion.